Ted is alive again. Ran with him this morning on our standard 10.04 course. We covered the first half in 34:34 chatting, telling stories, discussing current events. On the way back I felt like doing a short light tempo on the standard 2.5 stretch. Made a pit stop, Ted kept going. Started out a bit sluggish, thought I was perhaps going slower than 6:00, but I was not - first 300 in 1:06 with each 100 in 22. After than I sped up to a fairly steady 5:40 pace on the flat, then pushed harder on the hill (or more accurately the rise) to keep the pace steady, and then on the last quarter there were two things that encouraged me to go faster - I was 2 seconds behind the 5:40 guy, and there was a family out for a bike ride within reach. My greyhound reflex kicked in, and I ran the last quarter in 1:21 to finish in 14:08. HR stayed below 153 on the first 1.5, climbed to 156 on the rise, and reached 158 during the pickup on the last quarter. 5:40 felt very relaxing on the flat. When I passed Ted, who was going around 6:10 pace, he also decided to do a mini-tempo, and seeing how slowly he was coming to me, I invited him to join me in more words than I normally do at 5:40 pace. On the last mile, the pace felt harder, more like a surge during the marathon. The last 0.25 felt like a threshold pace. So the slow pace is starting to feel quite a bit easier, now the trick is to stretch the range of that slow easy pace upwards, and first get 5:30 into it, and then maybe even 5:20. Ended up doing about 10.1 for the whole run, the extra distance from coming back to Ted after the finish of the tempo. Total time for the run was 1:06:27. Ran 0.5 with Julia in the morning, and then 2.14 with Benjamin and Jenny ( Jenny rode the last 0.57 in the stroller) + 2.5 in 16:59 to reach the goal of no less than 15 for the day. Warmed up with Ted. His foot is still hurting. Then did my usual Tuesday workout. First, 5x400 with 200 recovery, very slow jog, alternating directions on the quarter from 1 mile mark o the standard Provo River Trail tempo run to 1.25. 73.0 - 73.3 - 72.8 - 71. 8 - 71.0 - a bit slower than a week ago but felt fresher afterwards. Then jogged back to the start of the tempo. The goal again was to run each mile faster. This time I watched the pace more carefully, adjusting it with every 200 in the first 1.5 miles. Splits by the quarter: 1:22 - 1:23 - 1:22 - 1:22 (5:29) - 1:22.5 - 1:22.5 - 1:21 - 1:21.5 (5:27.5, 1:56) - 1:21 - 1:22 (eased off before 180, 13:39 at the turnaround) - 1:22 (recovering from 180) - 1:17 - total time 16:18.5, last mile in 5:22 - reached my goal. One second slower than last week, though, but a stronger finish. Jogged to the start of the final part of the workout, same as the opener, exact same place, 5x400. 72.7 - 73.3 - 71.6 - 73.0 - 67.5. This part was faster than last week, and I felt a lot fresher on the last one. Last week on the last interval the limiting factor seemed to be heavy legs, this time it appeared to be more the lack of ability to turn on explosive power full blast. Cooled down, total of 14.75 for the workout. Ran with the kids in the evening, this brought me to 17.25 for the day. My current pace profile is getting to be rather odd: 5:40 - relaxing, 5:30 - comfortable, 5:20 - very hard, 5:10 - near death experience. High mileage, at least initially seems to make the paces up to 5:30 more relaxing, but does not do much for paces faster than 5:30 to bring them into the comfort zone. I need to figure out a way to bring 5:20 into the comfort zone. Update: Today I am officially starting a blog campaign to encourage Devine Racing to pay the prize money due top runners. I have so far found out that Steve Ashbaker (5th in the SLC marathon), and Nick McCoombs (4th in the SLC marathon) have not been paid. 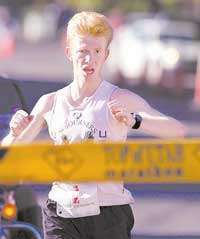 I'll try to reach Hobbie Call (2nd place in the SLC marathon today) and see if he got anything. According to Nick, last year he and Hobbie got paid after and with the encouragement from some TV coverage. Easy run at 4:55 AM, Ted was not there, his foot was still hurting, he took it easy. Started out at 9:00 pace, and it felt brisk. I think I set a record for the low HR in the summer after 0.4 miles of running - it was 99. Nothing compared to Lasse Viren, though, who could hold 84 at 8:00 pace. Gradually kept waking up throughout the run. Hit the first half (5.02) in 37:57. On the way back, eventually worked my way up to sub-6:40. Sped up to about 5:50 pace on the last 0.5, total time 1:11:26. Why do I always make a big deal about how hard 9:00 pace feels at the start of my run? Because I see many runners go out on a supposedly bad day, not feel good in the first mile or two, and cut their run short. I believe this habit costs them good 10-20 minutes in the marathon or possibly more from all the runs they've cut short, or even worse, not started at all, instead of plodding along through the distance. Today I did not start feeling really good until I've run 8(!) miles. I was not having a bad day, my body was just taking its time to wake up. That is what happens when you start getting in shape - the body learns to sleep while you run, or while you live in general, that is how it becomes stronger. Ran with the kids in the afternoon, then took Benjamin to the Team Provo practice. Jogged a bit around the track, then ran a calibration/break the boredom 600 in 2:02. Had a hard time getting going, I think 90 degree heat contributed to it. Then did 10x100 strides with 100 meter jog back in between. In the first 7, all were in the range of 16.1-17.3. Then on the 8th I saw some kids doing an interval. I let them build a bit of a lead, and then started my 100 with a goal to catch them. Passed one, saw that the other was faster, sped up to try to catch him before the line, almost made it. The time was 15.2. I did not think it would be that fast, maybe 15.7 at the most. Did the next one in 16.8, and then on the last one decided to test my speed. Felt tense, and all I could do was 15.2. It felt all-out this time. Very odd. So for an experiment I invited Darren (the coach, decathlete, 11.8 100 m PR) to "race" me. He was wearing street clothes, and he was not going to sprint all the way out, just fast enough to make me think I was racing him. With his help I was able to run 14.5! So here is the odd stuff. In the winter of 2005 I did an experiment to see how much raw speed I could build. I did 10x60 uphill twice a week close to all out, and 6x400 in 63 each with full rest, or 8x200 in under 30 with full rest for the third speed workout. Kept the mileage at 60-70. After a couple of months of that training I was able to run 13.9 100 with tail wind, competition, and a slight running start. Now I do 90+ miles a week, no sprint work aside from quarters at mile race pace, and I run 14.5 with a standing start - not much speed loss at all, or speed gain from the speed training on the other hand. Cooled down some more afterwards, reached the goal of 15+ for the day. Let's start with the blog campaign message for Devine Racing - pay your runners! Any ideas of the most effective way to get the money out of them? I find this feet dragging on the pay check particularly upsetting. It is not just a matter of a few hundred or a thousand dollars to feed the starving runner ( neither Nick, nor Steve, or Hobbie are rolling in dough), it is a matter of respect. We talk about The Zone referring to the last 6 miles of a marathon. Those guys quietly put themselves in The Zone every day to run as well as they do except there is no marching band to cheer them up or volunteers handing out drinks. They come home, they are still in The Zone and they have to do what everybody else does. The pay check for this is very minimal, losing the kick cuts it in half, hitting the wall with a mile to go can mean no paycheck that day after all the work. Sometimes it is 5 really good runners, the money goes 3 deep, and someone will have to go home empty handed. So when it comes, it is a hard earned treasure. I personally value the paycheck a lot more than a trophy. If I want a trophy, all I have to do is find a race that is sufficiently non-competitive. With the paycheck, there is no cheating - you have to be good to get it. And you bring something home, it helps pay the bills. I cannot quite put it in words, but I feel there is something morally wrong in intentionally taking your time to pay the runners while the money earns interest in the bank for you instead of your runners. As for the training, Ted is alive again, and we able to lure Nick McCoombs into coming to run with us. Ted ran easy, Nick and I did 6x1 mile on the trail alternating directions with 200 meter recovery in between - very slow jog, about 1:40 or so. The target pace was 5:20. I got the inspiration for this from analyzing the training of Chris Rogers. I noticed that while not being fit to do so, he would run at 6:29 pace on a hard course, and call it easy. I wondered why, then realized this is probably how fast he ran in college on on his easy runs, and the memory of that was driving him. In this case, it was doing him harm, but I was inspired by the idea of building a muscle memory to trick the body into thinking 5:20 is threshold. We did 5:16.7 - 5:17.1 - 5:17.9 - 5:19.2 - 5:21.2 - 5:19.2. The pace kept getting more and more uncomfortable for me, Nick was fine. After 4, I decided to run the 5th one a bit easier. We hit the half in 2:42. I felt so much better. Then I was able to push in on the second half in 2:39. On the last one, I decided to follow the same approach. We hit the first quarter in 1:22, then 1:21, that felt so much more comfortable. Then the final 0.5 hard. Steady pace - 1:18, 1:18. That felt like a near death experience (as opposed to just very hard). Afterwards, I told Nick and Ted the workout overall was comfortably painful. Nick remarked than only an endurance athlete would know what that means. Ran with the kids in the evening + another 1.5 with the double stroller. Benjamin went through all 18 gears of a semi truck starting out at 9:30 pace and finishing at 6:40. His last mile was 7:16, and his last 0.5 was 3:25. Easy run with Ted and Nick in the morning. 10.04 in 1:11:55. Picked it up on the last quarter to beat the 1:12:00 guy, ran it in 1:26. Ran with the kids in the evening and added more to make it 5 miles. Provo River 10 miler tomorrow. Ran the Provo Riverwoods 10 miler. 54:13, 1st place. 1:08 slower than last year. I wondered why, since I did not feel any worse - both times running with tired legs, but this year not anymore than last year. Checked the weather reports - this year the last 5 miles were done with the temperatures of 75-77 while last year it was only 60. That probably explains the slowdown. I was 16:46 at 3.23 mark this year, which was about 20 seconds faster than last year, and is only 18 seconds slower than my record for that stretch done with Steve's help. Afterwards, I felt strong, but lazy, probably from the heat as well as from the fatigue of high mileage. Managed to keep my head above water, though - kept most mile splits under 5:30, hit the standard 3 mile tempo stretch from Nunn's to the mouth of the Canyon in 16:27. HR was at 159. After the finish, fixed the consequences of the power outage with the timing system, and then hurried back to finish with the Fast Running Mommy. She reached her goal of breaking 1:30 with the time of 1:29:45. James and Lybi stayed at our house. James ran 1:08:31, this is starting to smell like he can get a BQ in St. George.